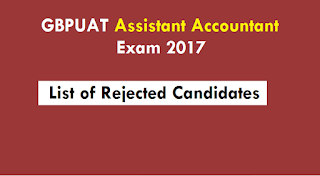 As you know G. B. Pant University of Agriculture and Technology also known as GBPUA&T or Pantnagar University is going to conduct Assistant Accountant exam 2017 ( Sahyak Lekhakar ) on 23 July 2017. GBPUAT has publish the List of Rejected Candidates. There are 317 candidates in rejection list due to various reason . Here you can check your name and reason for rejection. 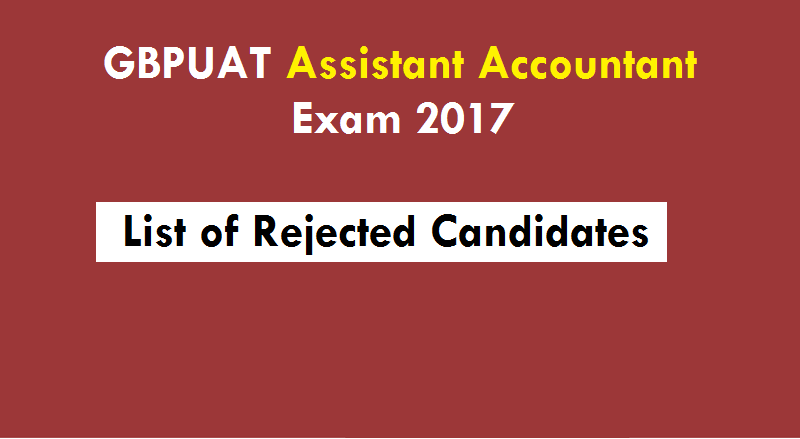 For GBPUAT Assistant Accountant exam 2017 result and answer key updates keep vising www.ukssscjob.in. List of Rejected Candidate : GBPUAT has rejected the application form for the following reasons as per recruitment advertisements. below you can list of rejected application and reason for rejection. ⧫ Over age / Under age .The candidates age may be less than 21 year or more than 42 years..
⧫ The online application form is not fully filled.⧫ The candidate has not attached their photographs.⧫ Mark sheet is not attached with application form. ⧫ Birth date is not confirmed. ⧫ Academic qualification certificate / Mark sheet is not attached. ⧫ Reservation certificate is not available. ⧫ Incomplete Application form/ Application received after the end date.